In partnership with rand corporation, new economics foundation and an international interdisciplinary panel of experts, the city created a framework for measuring community wellbeing using existing and emerging research into what makes people and communities thrive. The index was released in April 2015 providing a foundation from which the City and community can make data-driven decisions. 18 experts and researchers from around the globe advised on the creation of the Index. The GO system is the City's on-line request portal available 24/7. 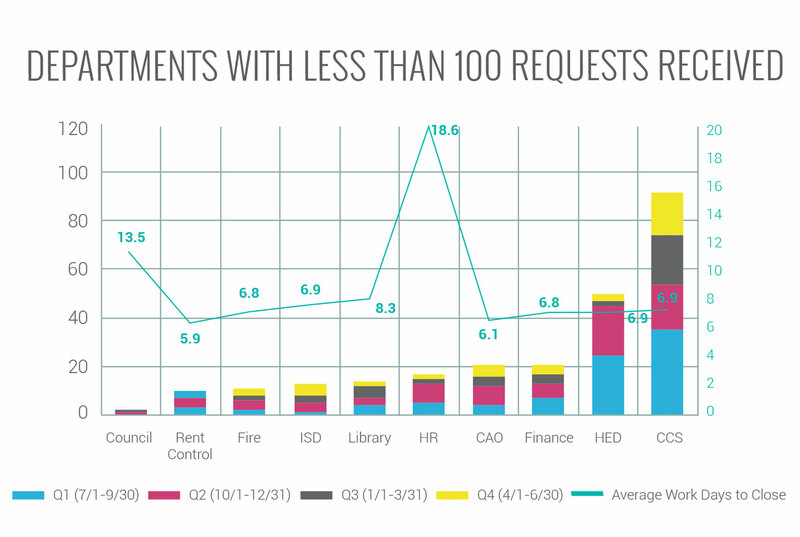 During FY 14/15, 10,474 requests were received and on average, closed within 5.5 days. The most common GO requests are related to Graffiti, Lost & Found, Public Records Requests, Bus Operator Concerns, and Leafblowers. Socrata and opengov data portals allow users to pinpoint everything from crime on their block to projects that will improve their street. users access information from over 36 data sets, allowing them to isolate, group, and compare the data in order to analyze and even project trends. the site received 249,000 views and reflected 50.6 million rows of data. SMCityNet upgraded to 100Gbps, demonstrating a commitment to continuous innovation and delivering globally impressive broadband speeds to Santa Monica businesses and start-ups in Silicon Beach.